In 1988 NASA's James Hansen and seven co-au­thors wrote a highly influ­en­tial, ground­break­ing cli­mate mod­el­ing paper entitled, Global Cli­mate Changes as Fore­cast by God­dard Insti­tute for Space Stud­ies Three-Di­men­sional Model (pdf). They used NASA GISS's GCM Model II (a pre­de­cessor of the cur­rent Model E2) to pre­dict future cli­mate change, under sev­eral scen­arios. 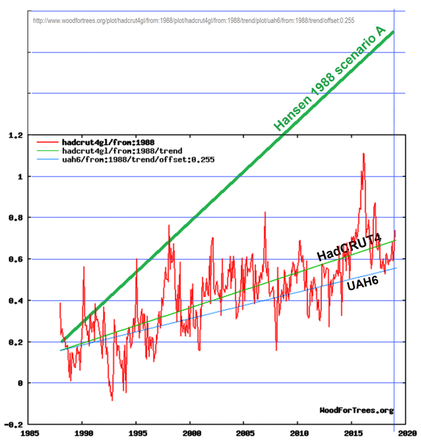 They con­sidered the com­bined effects of five green­house gases: CO2, CFC11, CFC12, N2O, and CH4. Now, I would agree that +0.5°C/dec­ade would be something to worry about! For­tu­nately, it was non­sense. Even so, cli­mate alarm­ists fre­quently claim that the NASA GISS model was “re­mark­ably accur­ate.” Only in the massively politi­cized field of cli­ma­to­logy could a 200% error be described as remark­ably accur­ate. Even eco­nom­ists are embar­rassed by errors that large. So there's no excuse for Hansen's August, 1988 paper nev­er­the­less pro­ject­ing expon­en­tial increases in CFCs, in any of their scen­ar­ios. They obvi­ously knew CFC emis­sions would be fall­ing, not ris­ing. Yet they pro­mo­ted a “scen­ario” as “business as usual,” which they knew was actu­ally impos­si­ble. So, even though the authors got just about everything wrong in their paper, it was nev­er­the­less a great suc­cess, because it accom­plished what it was inten­ded to accom­plish. What did they learn from their mis­takes? Of course 1988 was a long time ago. So do you think per­haps they've got­ten wiser? I'm kid­ding, of course. 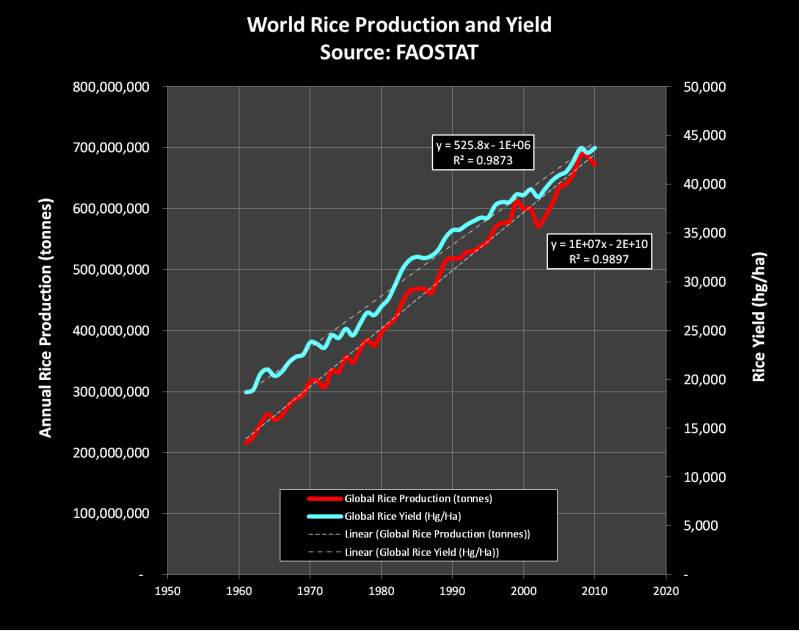 The same peo­ple who say we should trust the cur­rent GCMs also uni­form­ly but pre­pos­ter­ous­ly in­sist that the pre­dic­tions of the older GCMs were pret­ty good. 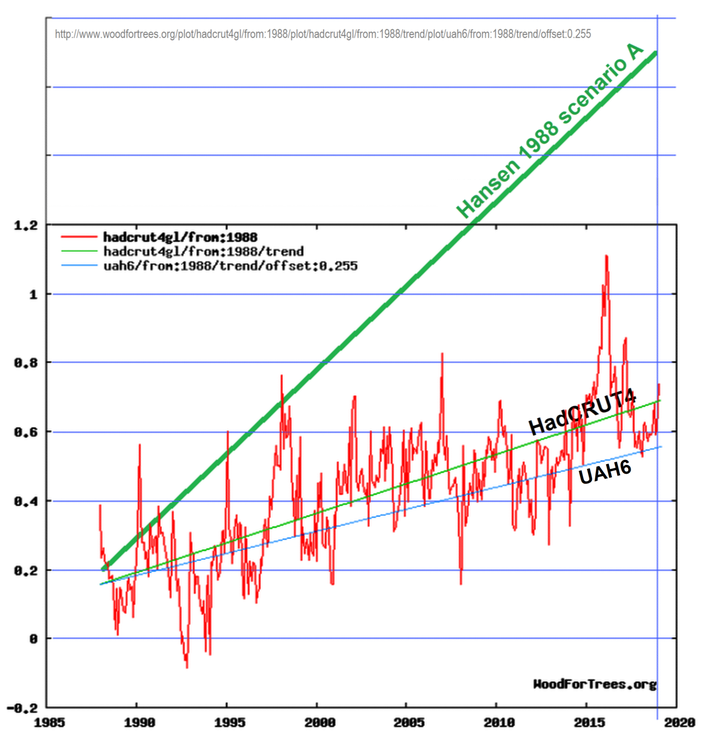 Here are exam­ples from RC, SkS, and Carbon­Brief; all three con­flate CO2 levels with CO2 emis­sions, and then pre­tend that Hansen's “Scenario B” was the clos­est to real­i­ty. Their refus­al to ack­now­ledge the proven pre­dic­tive fail­ures of older models under­mines their cred­i­bil­ity w/r/t future pre­dic­tions from newer models. 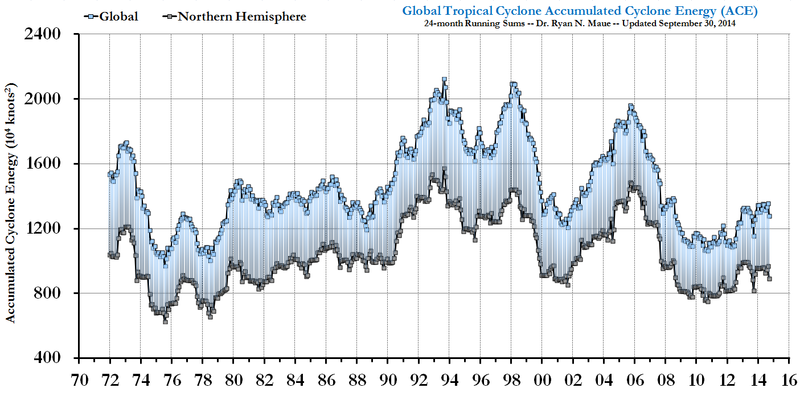 Despite the fail­ures of his past dire pre­dic­tions, Hansen remains one of the most stri­dent alarmsts, e.g., with his very loud, very pub­lic, and thor­ough­ly un­sci­en­tif­ic warn­ings about the peril of “ex­treme weather” due to anthro­po­genic cli­mate change. He even pub­lished a book in 2009 entitled, Storms of My Grand­chil­dren: The Truth About the Com­ing Cli­mate Cata­strophe and Our Last Chance to Save Human­ity. 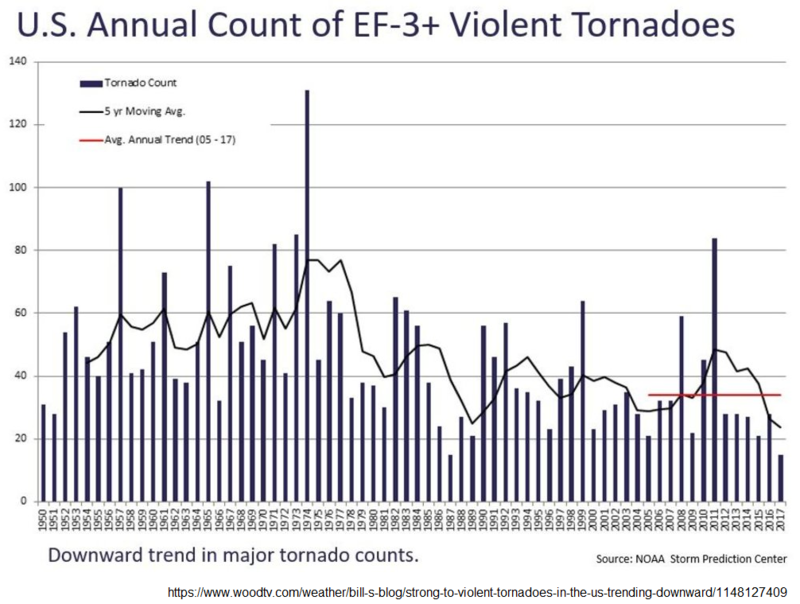 Hansen said that the “in­creas­ing tem­per­at­ure gradi­ent [between high and low lat­it­udes] is going to drive stronger storms,” as lower lat­it­udes warm faster than higher lat­it­udes. But it is now known that that pre­dic­tion was exactly back­wards. His book is com­pletely wrong. The real­ity is that in the north­ern hemi­sphere “po­lar amp­li­fic­a­tion” causes extreme lat­it­udes to warm much faster than most other places, and sta­bil­iz­ing neg­at­ive feed­backs reduce warm­ing in the trop­ics. So anthro­po­genic cli­mate change causes a reduced tem­per­at­ure gradi­ent, rather than increased. 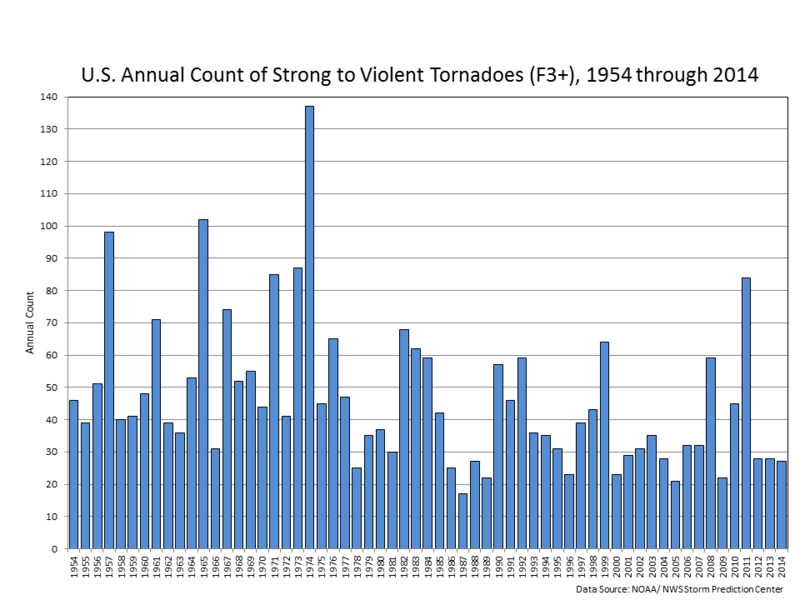 I hes­it­ate to call the slight decline in trop­ical cyc­lones a trend, but severe tor­nadoes are cer­tainly down. 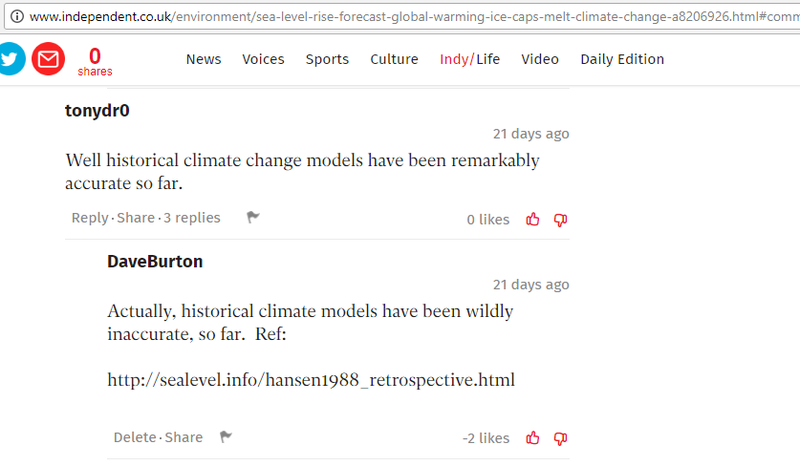 Yet Hansen and other prom­in­ent cli­mate alarm­ists still won't admit that a ben­e­fit of anthro­po­genic cli­mate change might be a reduc­tion in extreme weather. You've heard that “no news is good news?” Well, in cli­mate sci­ence it's the con­verse: “good news is no news!” Cli­mate alarm­ists and their allies in the press rarely report the good news, about reduced extreme weather, improved agri­cul­tural pro­ductiv­ity, and a green­ing planet, thanks to anthro­po­genic CO2. https://moyhu.blogspot.com/2015/10/hansens-1988-predictions-revisited.html (and also these blog posts). 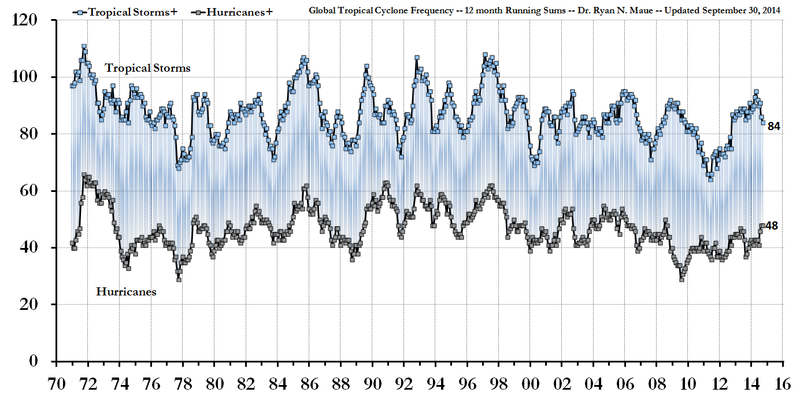 RC, Hausfather/CarbonBrief, Nuccitelli/SkS, & Nuccitelli/TheGuardian all made less compe­tent attempts.